I'm trying to install Windows 7 Pro onto a pair of Samsung 950 Pro drives in RAID 1. For the life of me, I cannot get past the "Missing Drivers" error. I have the latest Intel NVMe driver, though that doesn't do much good if I cant install the OS. The Windows installation picks up an Intel Rapid Storage RAID driver, from the ASRock CD, but fails to install it. I'm sure I'm missing something obvious here, but if anyone has any suggestions I'd really appreciate it. This is all taking place on an ASRock Z170 Extreme7+, with an i7 6700K. Thanks! NVMe installation using RAID is definitely convoluted and requires very specific steps, I found that video really helpful in understanding them. I have not had a chance to try them myself as I'm away from my home office but hope to succeed myself this weekend. I actually did follow that video. Issue is, they're installing Windows 10 and I'm installing Windows 7. There's an additional issue presenting that I can't get past, namely the "A required CD/DVD drive device driver is missing" error. This prevents me from getting to the step where they install the RAID controller driver and I can't figure out how to get past it. I'm pretty sure I have the drivers I need, and they're on the USB I'm installing Windows from, but I can't get it to recognize them (or even see that they're there). I was looking over the Bios updates for the x99 boards. They were updated to support NVMe. If you are installing Windows 10 on a NVMe ssd do you still need to use one of the methods you described on the first page or can you install with the default UEFI? On some boards you do not need to configure the UEFI. Is that the case with the x99 boards? As far as people attempting to install windows 7 on a NVMe ssd. You could install window 7 on a standard HD or SSD updated it to 10, make sure windows 10 has been activated on the computer and then clean install windows 10 on the NVMe ssd. When it asks you to enter the product ID click (skip this). If the windows 10 upgrade has been activated on the computer it will activate when the installation is completed. I just wanted to report back that I was able to follow instructions from DooRules's suggested video and a response from AsRock tech Support which allowed me to install Windows 10 on a pair of RAID 0 Samsung 950 Pro NVME M.2 drives. Everything went smooth and performance is great. 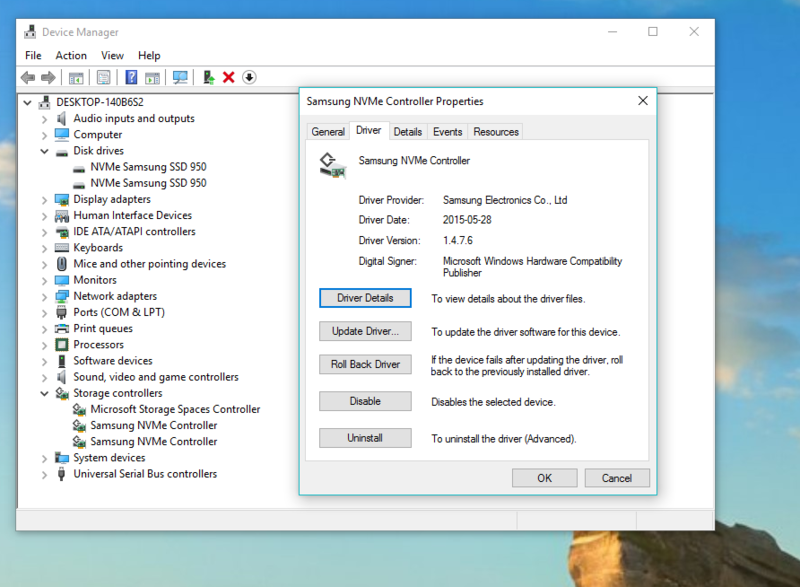 It appears that when you pass Samsung drives through the Intel RAID driver, they loose their identity - Samsung Magician software no longer recognizes them as Samsung drives, and the Samsung Windows 10 NVMe driver which is supposed to provide much better performance than the native Windows 10 driver) will not install. Samsung has nothing more than version 1.0 of the NVMe driver on their website and no technical notes regarding Magician with RAID. Does anybody have any ideas on this? I had to break array, switch back to achi mode and install samsung nvme drivers. I did not have an OS on the array though. As long as you are in raid i don't think it will matter though, the irst drivers are running the show for you now. I remember magician showing a really weird name for them, it was like something all jumbled up, lol. I used this driver and the 1.0 on Samsung site. Not much difference performance wise from one to the other although i did end staying with the 1.4.7.6 version and I am currently using it on both my 950's right now. That driver seems to require that Windows already be installed. I can't get through the Windows installation because it claims I'm missing a CD/DVD drive driver. I meant that you might need the f6 variant of that driver to load at the windows screen where you pick the drive to install windows on.